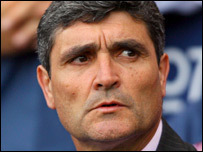 Sevilla coach Juande Ramos is being tipped to take over as Tottenham manager after Martin Jol's sacking. Spanish football journalist Graham Hunter told BBC Radio 5 Live that Spurs had made a "take-it-or-leave-it" offer to Ramos to become manager immediately. Sevilla director of football Ramon Rodriguez was in London on Thursday and it is thought he has begun negotiations with Spurs over compensation for Ramos. Spurs reportedly want Leeds assistant boss Gus Poyet to assist Ramos. Ramos's current Sevilla contract expires at the end of the season. But Tottenham, with only one win in the Premier League this season and languishing in 18th place in the table, do not want to wait until then for the man who has led Sevilla to the Uefa Cup title in each of the last two seasons and into the Champions League for the first time. There has been no official word from Sevilla or Ramos himself, while Alvaro Torres, Ramos' agent, told Europa Press: "I can't say much. It's another rumour and that's all. I don't have anything else to say about it." Spanish newspaper Marca claim Ramos wants to leave Sevilla immediately but Hunter believes Spurs will face a tough time negotiating his early release. "Rodriguez was in London on Thursday beginning to negotiate with Spurs the get-out, the way in which Seville would have to be compensated," said Hunter. "In Spain, the word is that Spurs made a take-it-or-leave-it offer - it was the third time they spoke to him and they said 'if you want this job, now is the moment or we move on'. "I think Seville will push extremely hard for compensation. "The president is a difficult man to deal with and will kick and scratch and fight for compensation, and if Juande Ramos walks out the situation will become still more messy. "The delicate moments for Tottenham will continue over the next few days and the negotiations will need to be very, very clever indeed." It is thought that Ramos wants to install Gus Poyet as his assistant boss at Tottenham but the Leeds assistant manager insists he has not been approached. The former Uruguay international, who played for Tottenham between 2001 and 2004 told BBC Sport earlier on Friday: "Everybody is calling me and sending me texts about it but I don't know anything. I haven't spoken to anyone. "I don't know if something has gone on between the clubs. I don't have a clue." Leeds said they had not received an approach from Spurs for Poyet - and would not welcome one. However, the club later revealed Poyet has been asked to stay away from Elland Road for the League One game against Millwall on Saturday. A statement said: "Leeds United and Gus Poyet have agreed that in the best interests of the team he will not be in attendance at Elland Road to allow the players to fully focus on the game without any distractions." Former Germany coach Jurgen Klinsmann and Blackburn boss Mark Hughes have also been mentioned as possible Spurs targets in the past, but Ramos is now the overwhelming favourite. Hughes moved to distance himself from the vacant position in any case, saying: "I would suggest any appointment that's to be made is obviously in place. My interest is solely in Blackburn. "I've seen my name a couple of times linked with it but I just view that as a reflection on the job myself and the staff are doing here, and the players are doing." BBC Sport understands the Spurs board made the decision to sack Jol before the 2-1 defeat to Getafe on Thursday but decided not to inform the Dutchman until after the game. However, rumours about Jol's imminent departure spread around the ground during the match - which was watched by Rodriguez. Apparently, Berbatov said, "If you're going, I'm going too." Jol said goodbye to Tottenham's players at the club's training ground on Friday and assistant Chris Hughton and the club's goalkeeping coach Hans Segers have also been dismissed. The BBC understands there will be an announcement from Tottenham over the weekend about their next manager. "I don't think there will be an announcement on Friday. That's what I'm led to believe. I think it's more likely to be after the Blackburn game on Sunday," said Radio 5 Live football reporter Mike Sewell.